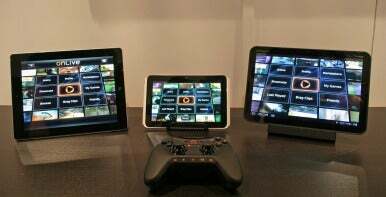 Streaming video game service OnLive on Thursday introduced an array of popular video games formatted for playing on smartphones and tablets—including iOS devices. We’re not just talking Angry Birds, puzzlers, and social games—these are top-tier titles like Batman: Arkham City, L.A. Noire, and Assassins Creed: Revelations. The company launched a version of its client software that supports tablet game play, bringing a new market of high-end games to mobile devices that iOS hasn’t seen before. 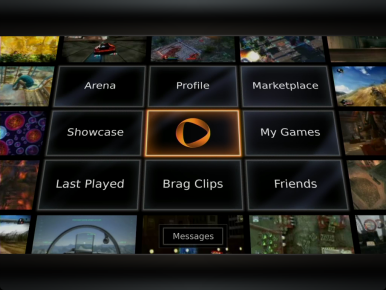 OnLive is not strictly a gaming console­, it’s actually a streaming service. 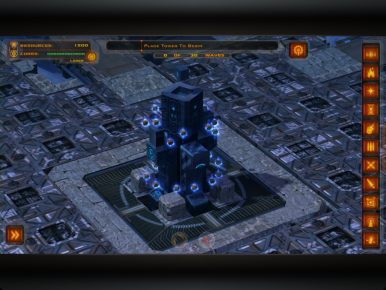 Games run on OnLive’s remote servers and stream to the company’s client software, which runs on your computer, through your TV (powered by the OnLive micro-console), and now your iPad or iPhone. OnLive’s video compression technology greatly minimalizes streaming lag, making the delay unnoticeable to players and ensuring that this doesn’t affect game play. Sign up is free, and most games have free demos available for subscribers to try out before deciding to rent or buy the title. Users have a few purchasing options. Complete games range from $2 to $50, depending on the title, or you can opt for a 3-day or 5-day game rental. OnLive also offers a Play Pack option for $10 per month, which includes unlimited play of more than 100 games (many games can only be played in multi-player mode through Play Pack, however). If you purchase or rent a game, it’s available to play on all platforms, and because game-saves are stored in the cloud, you can pick up where you left off on any OnLive powered device. You could, say, play a game on your iPad during your morning bus ride to work, continue playing on your computer during your lunch break, then finish up when you get home on your OnLive micro-console. Previously, OnLive offered a viewer app available for the iPad, where you can access the OnLive Arena and watch live gameplay from other players, watch Brag Clips of games recorded by others, and access the social aspects of OnLive like sending messages and adding friends. But now OnLive subscribers can actually play games with the new software and still have access to all previous app features. There are some Wi-Fi system requirements: games are playable with as low as 1Mbps, but 2 to 3Mbps is recommended to get full HD experience. 5GHz-only Wi-Fi yields best results, but 2.4GHz works fine. You can play via 4G LTE cellular connectivity on certain devices (like the Samsung Galaxy Tab), but you must be on Wi-Fi to play on iOS devices. The mobile software includes three different types of game formats. The first and most impressive of the bunch are the native touch games that support iOS Multi-Touch functions. Players move through games by dragging characters to move them, tapping objects to pick them up, and using pinch and zoom controls. These touch features are still a little buggy; I often had to repeatedly jab the screen to get a game response and apply more pressure than I usually do when using my iPad. Only five game titles have been programmed for Multi-Touch support, including L.A. Noire and indie game favorite Defense Grid Gold. Scroll, tap, and zoom your way through Defense Grid Gold with native touch. About 20 more titles have been formatted with a touch overlay. Some games have an Emulated Mouse overlay, while others have a virtual gamepad (VPad) overlay—a series of touch-enabled buttons and controls that emulate the OnLive wireless controller. Hold your iPad or iPhone like a controller, and use your thumbs to hit the buttons. While both overlay styles work fairly well, the VPad overlay can be a little counter-intuitive. I kept instinctively tapping the New Game button on the menu screen of each game I tried, before I remembered to use the touch cursor and A/B buttons. Touch-overlay games include titles from Lego (like Harry Potter and Batman), Virtua Tennis 2009, and Lara Croft and the Guardian of Light. 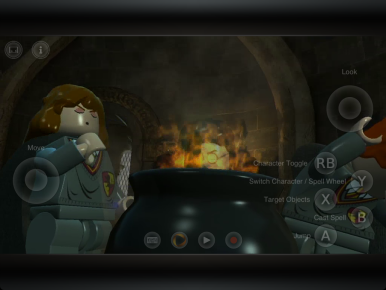 Lego Harry Potter uses a touch overlay for gameplay. The remaining games in the mobile library are games that require an OnLive controller to play. This gamepad connects to your iOS device via Bluetooth, and functions as if you were playing through a standard console. I recommend some sort of iPad stand if you’re using the controller–prolonged gameplay is awkward and uncomfortable if your device isn’t propped up on something. Batman: Arkham City, Deus Ex: Human Revolution, and 150 other games are available for mobile play with the added controller. The $50 universal OnLive wireless controller can be purchased through OnLive’s website, and can be paired with your micro-console, TV, and mobile device. During a game demo on Tuesday, OnLive’s President and CEO Steve Perlman stressed that many developers of hot game are currently working to provide more native touch and touch-overlay games for mobile use. To use the new OnLive app, you must sign up for a free OnLive account. As reported on Thursday, the OnLive app will eventually be available through the App Store, but the company, “can’t predict when the OnLive iPad app will be officially released.” If you register before February 5, 2012, you’ll get a free copy of Lego Batman. Although the improved OnLive app debuted on Thursday, the release of individual games is up to the game developers, so expect to see more iPad and iPhone-friendly games rolling out over the next few weeks. Editor's note: Updated 12/9/11 at 8:30 a.m PT to add more information about the availability of the OnLive app in the App Store.